Nicolet College students in the automotive technician program now have two additional vehicles to advance their skills on thanks to a recent donation by State Farm. 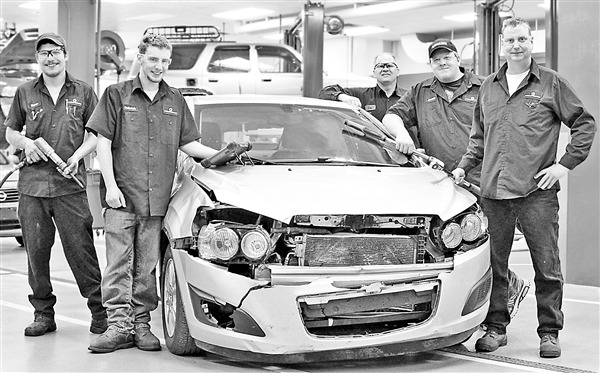 The 2014 Chevrolet Sonic and the 2012 Nissan Versa were totaled in crashes, providing students with the opportunity to learn how to repair multiple vehicle systems, said Nicolet auto instructor Ken Duesing. Nicolet’s automotive technician program currently has about 20 vehicles in its fleet for student training. This is the third time State Farm has donated totaled vehicles to the college. Past donations have included a 2013 Dodge Avenger, 2012 Ford Focus and a 2006 Chevy Silverado. Nicolet’s auto program is accredited by the National Automotive Technicians Education Foundation, which has specific requirements on the types of fleet vehicles students train on. “All of the vehicles donated have helped Nicolet meet that requirement, which is a significant benefit to the college as well,” added Duesing.